This salad is hearty enough for a full meal. And you can switch the fruits for whatever is in season. Slice off the stems of the Brussels sprouts and remove outer leaves individually. Then thinly slice the inside, so there is nearly no waste. Once you dice the apple and pear, immediately toss them in 2 Tbsp. lemon juice to prevent discoloration. 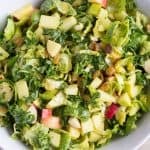 In a large bowl, combine Brussels sprouts, kale, radishes, apple, pear, and raisins. Give a good toss! In a medium bowl - whisk together the 3 Tbsp. lemon juice, vinegar, agave nectar, nutritional yeast, sugar, salt, and pepper until the liquid appears creamy. Then slowly whisk in the oil. Pour dressing over salad and toss well to evenly coast all the ingredients. Let stand for at least 15 minutes (and up to an hour refrigerated) before serving. This will help the hearty greens "soften" just a little bit.